We often think of battles as a "match up" of commanders. It is hard to find a battle (and campaign) that sees the individual clash of personality in a more important way - a decisively important way - that the clash between Darius III of Persia, ruler of the largest empire in the world, and a young man named Alexander, who ruled a small, semi-backward nation and a collection of Greek states where he had only recently had to suppress rebellion. The odds? Modern estimates vary from 3-1, to something worse than 5-1 against Alexander. Where we might expect the smaller force to pick favourable ground for a defensive battle, Alexander preferred to attack, even if that meant the battlefield Darius had carefully chosen and carefully prepared to give his army all the advantages. Alexander attacked and personally led the force that broke the enemy line, coming close enough (it was said) to call out Darius for personal combat. Darius fled. His army as doomed, and so was his reign. And the empire of Alexander was begun, John Keegan tried to give us perspective on Alexander's achievements. He asks us to imagine Bonnie Prince Charlie not only succeeding in taking back Scotland, but then conquering the rest of Britain, then Europe and was threatening the Ottoman Sultan when he died... just ten years after the campaign began. 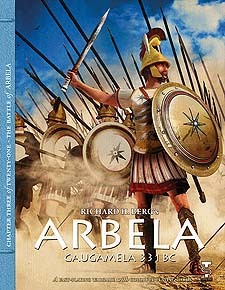 And Arbela was Alexander's most important battle. Now TPS lets you explore this decisive battle in an innovative, card-based system designed by Richard Berg. This is not a "card driven" game, but one in which the units themselves are large, colourful cards that capture the abilities and appearance of the two armies. And no map board in the traditional sense! Game options include an "historical" deployment or allowing you to "do better" on your own. Replay value is very high. Put your "personality" to the test and see how you fare, at Arbela.